How can businesses thrive in today’s fast-changing world? It cannot be overstated: we are living in a time of unprecedented change. The interconnectivity of people, businesses and markets has never been as strong and pervasive. Technological advances are transforming the way we live and work. And profound shifts are impacting our societies, resulting in distress and political tensions domestically and internationally. When looking for root causes, economic globalization is an easy target. Less attention is paid to the fact that new global value chains have moved over one billion people out of poverty. Yet while global prosperity has increased, so has inequality in the world’s wealthiest nations. Coupled with political polarization, inequality erodes a country’s social fabric in an economically damaging way: as cohesion and trust diminish, economic performance is likely to follow. Last year saw rising geopolitical tensions among the world’s major powers. These mostly played out in the economic field but more fundamental spillovers are possible, warns the Global Risks Report 2019. The idea of “taking back control” – whether domestically from political rivals, or externally from multilateral or supranational organizations – resonates across many countries and many issues. However, in a digitalized and interconnected world there is no way back. Protectionism is not a sustainable solution. Sheltering businesses from competition might sound like a good idea, but it does not work in the long run. And, as the Global Risks Report 2019 shows, energy expended on recovering national control risks weakening collective responses to existing and emerging global challenges. 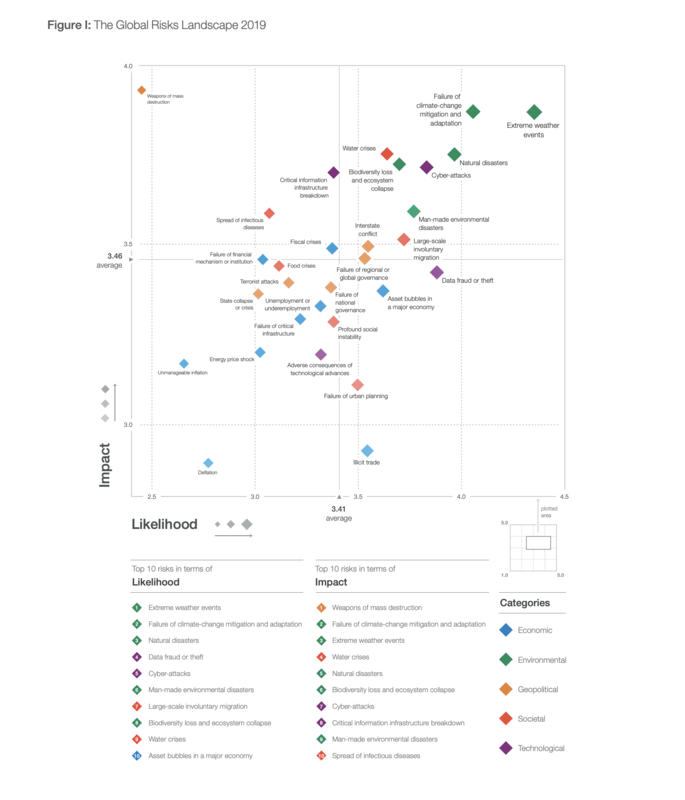 Image: World Economic Forum Global Risks Perception Survey 2018–2019. So, how can global businesses navigate this new context? What has become clear towards the end of this decade is that the geopolitical climate and protectionist sentiment renders a “one size fits all” approach ineffective. While value chains have become increasingly global, globally active businesses must pursue a multi-local approach and act as a trusted local player. This means that we need to demonstrate our strong commitment to each community where we operate in across the world. And in these communities, companies should contribute to solving their most relevant issues such as labour reskilling or infrastructure development. Sustainability is also becoming increasingly important, allowing businesses to foster the trust required for long-term relationships with customers. We must make profits by applying our capabilities and expertise across a much broader set of societal actors. I am also convinced that all stakeholders will be more loyal to a company that helps them contribute to social and environmental issues. Continuously, environmental risks dominate the results of the Global Risks Perception Survey. Neither the public nor private sectors can solve the challenges we face alone. We need to increase momentum on working together and resist silo thinking. As experts on risk management and risk transfer – and an industry where forging new partnerships around cross sectoral ecosystems has become imperative – insurance is well placed to take a prominent role in this new architecture. So here is the good news: I am optimistic. No way back doesn’t imply that there’s no choice on the way forward.